Los Angeles, CA — Thousand attended the 34th MLK, Jr. Kingdom Day Paradeproduced by Dr. Adrian Dove, President and CEO, which the place of Love on display. 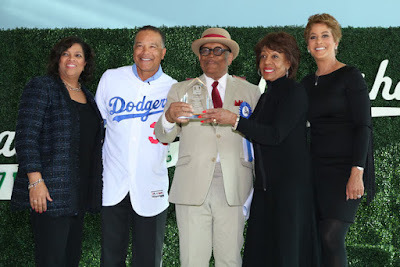 Street spectators were treated to a day filled with history coupled with music and dancing to celebrate the birthday of Dr. Martin Luther King, Jr. Dave Roberts, Manager, L.A. Dodgers was this years’ Grand Marshal. Congresswoman Maxine Waters, a previous Parade Grand Marshal, gave a riveting speech, while Leslie Sykes, Co-Anchor, ABC7 gave a pleasant flow to the VIP Breakfast as the mistress of ceremonies and hosted the television coverage with Michele Tuzee, ABC7 Co-Anchor. ABC7 broadcast the 34th Annual Kingdom Day Parade Live on Monday, January 21, 2019 from 11:00 AM to 1:00 PM. The Parade was proud to welcome back its Presenting Sponsor; Blue Shield of California. 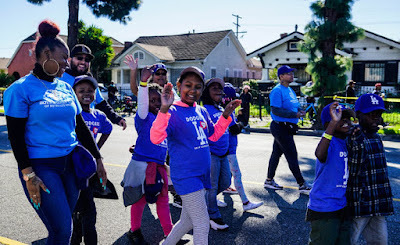 The three 3-Mile parade route began at Martin Luther King Jr. Blvd & Western Avenue, and proceeded west to Crenshaw and then South thereupon to Vernon Ave, with a Post-Parade festival at the Leimert Park ending of the Parade.